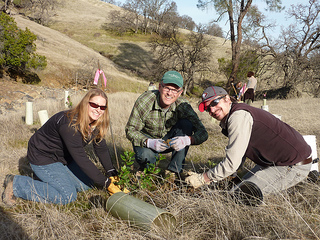 H. T. Harvey & Associates has been at the forefront of innovative ecosystem restoration and habitat mitigation work since the firm’s inception in 1970. Our expertise spans a wide variety of habitats and is particularly deep with regard to tidal and seasonal wetlands, riparian habitats, and arid lands. We also have considerable experience developing large-scale restoration plans in challenging stakeholder and landscape milieus—we realistically balance competing objectives and provide positive leadership while grounding plans in the best available science. Our team knows that every project is different, presenting a unique suite of wildlife and plant species, physical conditions, environmental and regulatory constraints, and goals. We have overseen more than 500 restoration projects for local, state, and federal agencies, as well as for private clients. These projects have included large-scale restoration efforts, such as the South Bay Salt Pond Restoration Project (the largest wetland restoration project in the western United States), the California Valley Solar Ranch on the Carrizo Plain of central California, the complex Upper Llagas Creek Flood Protection Project, and the Conservation Strategy for California’s Central Valley Flood Protection Plan. Our large staff of dedicated restoration ecologists, restoration planners, and landscape architects is capable of handling multiple major efforts simultaneously, and our considerable experience enables us to develop cost-effective restoration projects that anticipate and meet rigorous regulatory requirements. The H. T. Harvey & Associates team provides design support throughout the entire restoration process, from concept development through the production of construction documents. Our designs reflect the powerful synergy that we have built by integrating the skills of our restoration, wildlife, fisheries, and plant ecologists with those of our landscape architects. Together, we develop the restoration concepts needed to address each site’s particular challenges. We guide projects through the often complex regulatory agency approval process, and provide oversight of construction and long-term site management to ensure that goals are met. Our restoration sites routinely exceed established success standards, and are cited by resource agencies and other groups as commendable examples of successful mitigation, restoration, and monitoring.